I'm looking for my first modular synth. I'd like to create something musical, no super-strage melodies, but I'd like to interrelate melodies so i'd picked a quantizer, the quantimator, that should be the brain of my researches. 3 VCos because of the chords progressions, any advise on utility modules or any big oversight I did? Research polyphony on a modular synth. It's a lot more complex to do it right than you'd think. Typically, you'll use multiple VCOs stacked into a single voice. If you're looking at using three single voices in a polyphonic way, you'll need three VCOs, three VCAs, three filters, some sort of system for assigning new notes to an available oscillator. You'll have to tune each set of VCO + filter exactly the same. I think you'll find a modular solution to be pretty inefficient versus a DCO polysynth that just works out of the box. I agree with Ronin here. 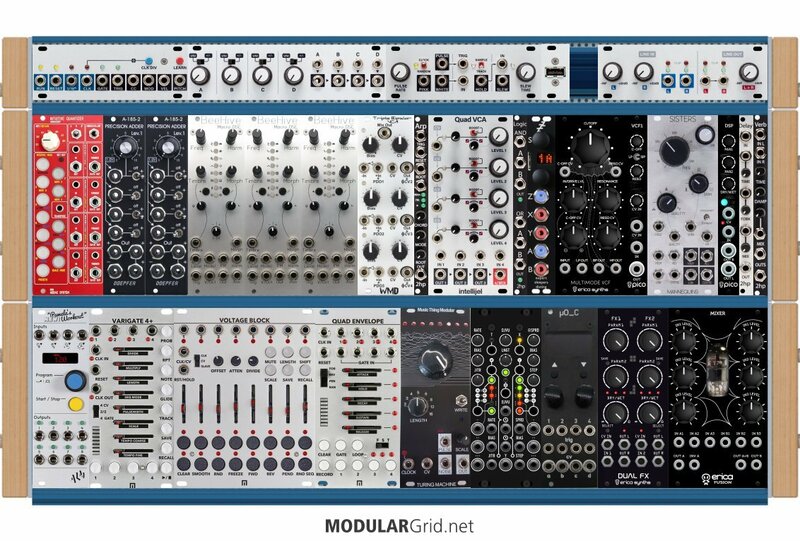 Doing a true polyphonic modular build is going to result in something very large and very, VERY spendy. Let's say you're talking a four-voice system. This means you need 12 VCOs if you want three per voice, four mixers to sum each set to their respective VCFs (also four of those), four exponential VCAs for just the audio level processing, EIGHT envelope generators (one each for the VCFs, one each for the VCAs), a one-to-four buffered mult per voice to allow you to send buffered CV to each VCO plus the VCF cutoff, 12 LFOs so that you can have discrete modulation sources for the VCO sets, VCFs, and VCAs to get pitch, timbral, and dynamic modulation, a four-voice MIDI converter unless you have a four-voice analog keyboard laying around, and some sort of stereo mixer to give you a stereo spread of your voices. Plus, if you want CV panning per voice, then you'll need four MORE LFOs, or perhaps looping AD envelope gens to make that happen, plus a CVable pan per channel on the mixer. And that doesn't even cover such things as clocking for sequencing/arpeggiation (the latter being quite useful with a polysynth) and the necessary module(s) for those two functions, FX processing, a stereo output module, and ultimately, a case with the space and amperage to deal with all of that. OTOH, an 8-voice Moog One costs $6k. Same architecture (3 VCO analog) with a lot more going on, program storage, built-in controllers, MIDI, all the usual fun stuff. And while $6k sounds like a pile, consider what the four-voice iteration above would wind up costing, with which you wouldn't get half the programming functionality. And far less clunky to tote around, given that the Moog fits in a case, and the modular would be in a cab about the size of a medium-sized HDTV. Moral of the story: polysynths should be polysynths unless you have the space and budget of Junkie XL, and modulars don't make good polysynths for the typical user. Paraphonic operation might be more tenable, but still quite pricey. 100% on the pricey part. Let's say you used a fairly basic VCO such as a Doepfer A-110-1 so that you can have sync and proper FM. Now, that streets for $200, more or less. So 12 of those is $2400 right there, if you keep following the 4-voice, 3-VCO example from my post above. Plus you also need four mixers; we'll use the Doepfer A-138b, keep it in the family. 4 x $80 = $320. Now we're at $2720...and we're not even to the VCF yet, nor do we have any LFOs for VCO modulation! Keep going along the same lines, and even a paraphonic 3-VCO 4-voice is going to wind up closing in on the Moog One 8-voice's price pretty soon. Might not hit it, but it'll still overshoot the vast majority of polysynths on the market right now. I really like to have dedicated pitch, VCA, and VCF envelopes and at least one utility envelope, also, no less than two LFOs, also those envelopes had better be DAHDSR. I also require two filters: one 12/24 dB/Oct and an HPF. Per voice, that is. That’s what my DSI Tempest does. Market rate: $1500 for a 6 voice polyphonic, dual VCO, two samples per voice synth with mod matrix, sequencer, and 16 Velo sensitive pads. Start with 3 micro Plaits. Malekko Varigate 8+ to sequence. Add a quad Envelope (Malekko or Zadar) and a quad VCA. Add a Batumi LFO with poti. Add the Black VCF, Three Sisters or QPAS, Black Hole DSP2, Erbeverb and a Fusion Mixer from Erica. To add interest, I’d suggest: 2hp Arp, uOrnament&Crime, Turing machine and/or Marbles, ADDAC intuitive quantizer. There is also a Chordizer to make things easier. It lacks the ability to sync OSCs, but gives you 3 voice paraphonic cspability.